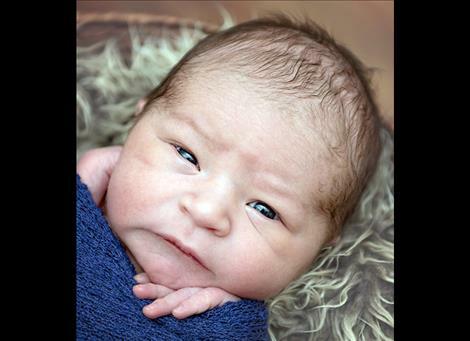 Polson — Tearian Mason Trombley was born Dec. 16, 2016, at the Nesting Place in Providence St. Joseph Medical Center. 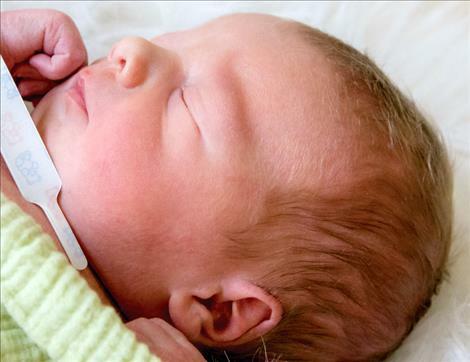 He was 22 and one-quarter inches long and weighed 9 pounds and 6.8 ounces. Tearian’s parents are Athena and Michael Trombley of Polson. Maternal grandparents are Brittany and Leon Fisher. Paternal grandparent is Lorraine Stasso. RONAN — Glenn Ray Mackey was born Dec. 10, 2016, at St. Luke Community Hospital. He weighed 6 pounds, 7 ounces. Parents are Michael and Kisa of Polson. Paternal grandparents are Rod and Amy Mackey of Kalispell. Maternal grandparents are Earl and Shana Hanneman of Polson. 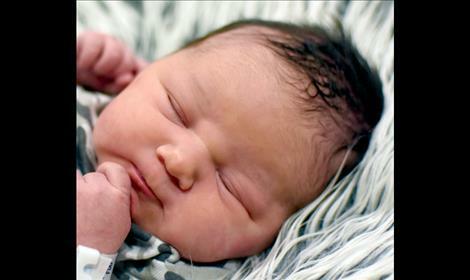 RONAN — Jozelynn Ray Cannon was born Dec. 15, 2016, at St. Luke Community Hospital in Ronan. She weighed 5 pounds, 15 ounces and joins brother Jonny Krause. Mother is Raylynn Cannon of Polson. RONAN — Kainon Joseph Incashola was born Dec. 8, 2016, at St. Luke Community Hospital. He weighed 8 pounds, 9 ounces and joins sibling Jaymi Incashola. Parents are Christopher Incashola and Jennifer Windon of Charlo. Paternal grandparent is Naett Incashola of Pablo. POLSON— Katherine Jean Ann Whitten was born Dec. 16, 2016, at the Nesting Place in Providence St. Joseph Medical Center. 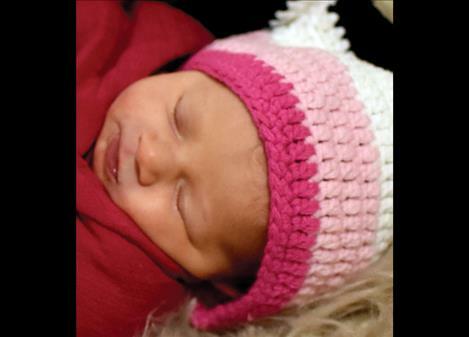 She was 18 and one-half inches long and weighed 6 pounds, 7.2 ounces. Katherine’s parents are Jennifer Pennington and Don Whitten. Anthony is Katherine’s brother. Maternal grandparents are Pam and Tony Pennington and great-grandparents are Cheryl and Bill Pickle. Paternal grandparents are Katherine Whitten and Donald Keith Whitten II and great-grandparent is Donald Keith Whitten. 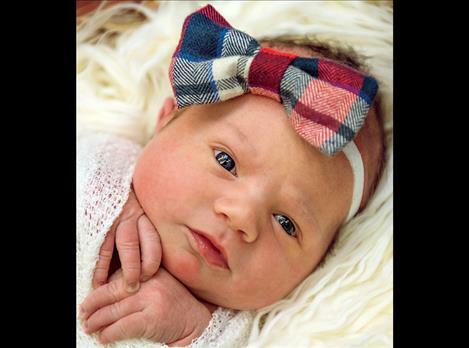 POLSON — Elly Alane Cheff announces the birth of sister, Olive Dawn Cheff, who was born Dec. 15, 2016, at the Nesting Place in Providence St. Joseph Medical Center. Olive was 21 inches long and weighed 8 pounds, 4 ounces. Her parents are Kendyall and Toby Cheff of Charlo. Maternal grandparents are Cynthia Davey and Mark Rochin and greatgrandparents are Justine and George Jennings. Paternal grandparents are Janie Bick and Mick Cheff and great-grandparents are Karen and Mick Cheff and Audene and Robert Kelley. Ryann Elverud RONAN — Ryann Jane Elverud was born Dec. 7, 2016, at 5:15 a.m. at St. Luke Community Hospital. 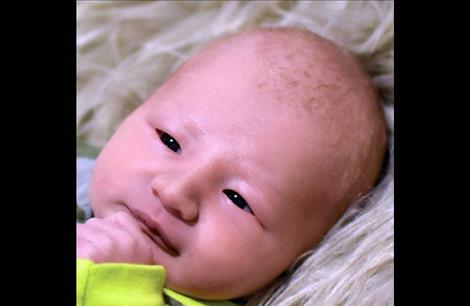 Ryann weighed 6 pounds and joins siblings Colin, Charlie, Dylann, Trip and Cash Elverud. Parents are Danial and Julianna Elverud of Dixon. Paternal grandparents are Craig and Darlene Elverud of Chester. Maternal grandparents are Chuck and Agnes Meyer of Las Vegas, Nevada. RONAN — Sedrick Nicolas Moll was born Dec. 4, 2016, at St. Luke Community Hospital in Ronan. He weighed 7 pounds, 12 ounces. Parents are Kevin and Kayla Moll and siblings are Xavier and Scarlet Moll of Charlo. Paternal grandparents are Robert Jr. and Amy Groom of Charlo. Maternal grandparents are Chris and Valerie Hertz of Charlo. 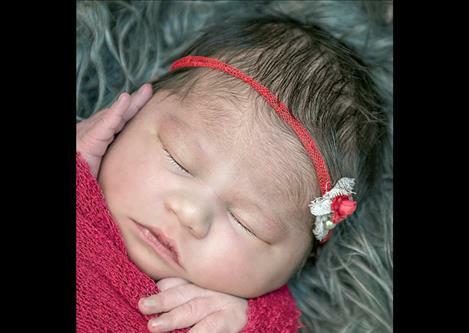 POLSON — Zemaya Adriana Guerrero is delighted to announce the birth of sister, Zefira Arletta Guerrero. She was born Dec. 13, 2016, at the Nesting Place in Providence St. Joseph Medical Center. 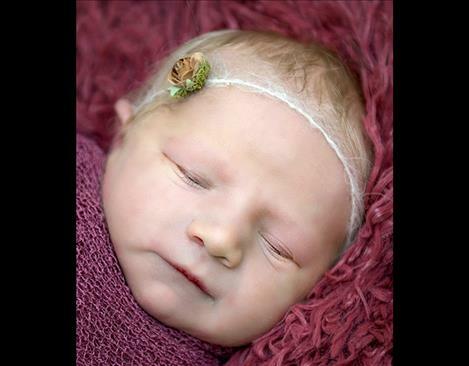 Zefira was 21 and one-half inches long and weighed 8 pounds, 15 ounces. Her parents are Tatyonna and Everardo Guerrero Jr. of Polson. Maternal grandparents are Felicia Fisher and Carlos Fonseca and great-grandparents are Brenda and Gary Fisher, Donna Brooks and Luis Fonseca. Paternal grandparents are Adrianna and Everardo Guerrero Sr. and great-grandparents are Emilia and Manuel Vaca and Martha and Roberto Guerrero.